just analysing the additional info on pins versus the expansion port cables..
i figure i can get teh 12v from teh powersupply jumpers on the motherboard. 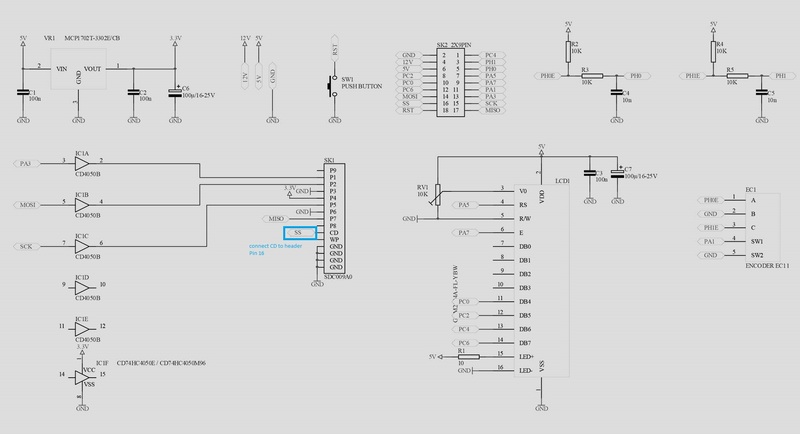 CURRENT WIRING BASED ON PREV SCHEMATIC. but no reading of teh characters..
could be a marlin config thing..... ??? doesnt match sd detect pin.. or adc keypad ?? so now i delv into marlin to make sure i did firmware closer to right with what i learned..
should i bother with 2.0 ? or 1.5 or 1.1 ? printer functioning ish ( workign on firmware tweaks now to maek things go the right directions and endstops work etc..
and hopefully by then i have the printer tuned enough to print mounts and cases for the boards. so what can i get for help or did my cranky sleepless day turn everyone off ? but sometimes will move up if you went down jsut prior..
the display is still sitting where the last post left it because i cant seem to figure where to connect it..
currently using hotglue to hold new end stops in place because need to print new mounts for the new style end stops. the y direction seems a little off true (two parallel bars and belts are nto pulling evenly.. causing it to skip in places or on fast moves..